"Alas, poor Yorick, I knew him, Alexa"
At this year’s Consumer Electronics Show it felt like Amazon’s voice assistant Alexa was being integrated into everything. Now one tech fan has taken things even further by turning Alexa into a talking skull. It's more alarming than the Amazon Echo, that's for sure. As part of what he calls the Yorick project, computer and robotics hobbyist Mike McGurrin used an old Halloween decoration to transform Amazon’s personal assistant and detailed the process in his blog. 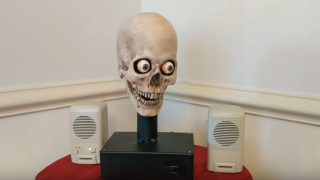 The blog describes how McGurrin used a 3-axis talking skull with moving eyes that had been a gift from his wife and combined it with a Raspberry Pi and the AlexaPi software to bring the skeletal personal assistant to life. We’ve seen Alexa integrated into everything from smartphones to fridges to alarm clocks, but McGurrin says his project was inspired by a hack which put the Alexa technology into an animatronic singing fish. “When I saw the Alexa Billy Bass I knew what I had to do, and the Yorick project was born. I’m pretty happy with the result” he said. We’re not sure how this particular skull would go down in a performance of Hamlet, but it just goes to show the sheer number of household items (if you can categorize an animatronic skull as a household item) Amazon’s technology can work with. You can see the skull in action below. We did always want to have our very own Murray from Monkey Island...but now we're not so sure.